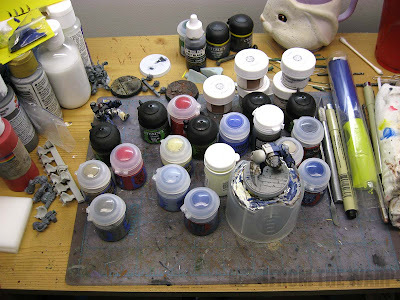 You can see my desk is loaded with all my new GW paints. I'm steadily working on my second Novamarine test model with all the new acrylics. It's been a slow week, but I have managed to steal a moment here and there before bed to add a wash or a highlight. As soon as I get him done, I'll be posting him along with some of my thoughts on the new paint line. I'd like to get the post out as soon as possible, but like everyone else, I'm juggling a thousand things at once and certain things must come first. I can promise that I will have a review of the new paints though. That's for sure. The new Novamarine is coming along nicely I think. At first, the new paints don't seem to be much of a change for me. That being said, I do paint a certain way and I'll be talking about that in my review. I can say now that I think I prefer the bone armour over the white armour after actually seeing it on the model. I think the combination of the bone armour and the new darker colored base will be what it takes to really make the model stand out. Here's the first Novamarine test model for comparison. amazing as always! I look forward to reading your thoughts on the new paints as I have yet to go out and get any for myself. I agree. The bone armor is head and shoulders above plain white. Much more depth to it. I really like the look of the blue too. I'm about to start painting using the new paints, could I ask how you created the blue armor? Rob: I'm working on it. Maybe this week if I can steal a few minutes to transfer all my thoughts over. TheRhino: Thanks! The picture makes it look lighter than it is in real life. But then again I did blend some additional highlights into it since I was trying the new paints. MasterM: Absolutely. 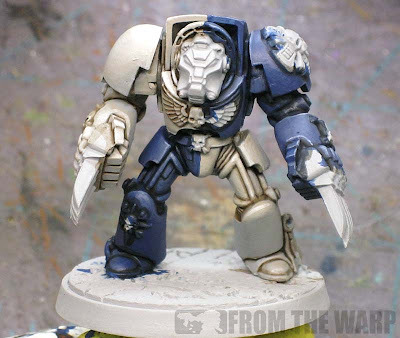 The model was primed with a light grey color. The basecoat is Kantor Blue followed by a wash of Nuln Oil applied to the recessed areas only. It's a zenith highlight of The Fang over the majority of the model after that. The edge highlight is Fenrisian Grey. Also looking forward to your review. I'm waiting for my order of new GW paints to arrive, but I do have pot of texture paint, one of the new dry compounds and one of the shades. I was a bit nervous about replacing the old wash range since it was so very good, but the shade seems even better. It flows much, much smoother and doesn't pool on surfaces at all. You can tell it's very different the moment you dip a brush in the pot and see the deep meniscus form. I painted a couple of white primed marine shoulder pads in Devlan Mud and Agrax Earthshade. Devlan Mud gave the whole shoulder pad a kind of uneven dirty look, while Agrax gave a smooth light brown tone all over and a deep brown in the recesses. For shading I think the new shades will be a massive improvement, but I'll have to find other ways to achieve some of the other things that I used washes for... maybe making my own. The texture / dry compounds you could really do without, but they made a quick and dirty base very easy to achieve. Much simpler than messing around with sand and PVA if you just want to get a quick effect on a base. FluffyPanda: I think if I ca get it (my review) done, I'll post it this coming Friday... otherwise it will go up on Monday. Krisken: Never thought of that, but now that you mention it... These guys do tattoo themselves as well. It's not the same as warpaint, but close enough I suppose. Oh, believe me, it's not really something which pops out. I believe it is like the "Christmas Curse" in that when the colors are used well, as they are done here, it's effect is no longer noticeable and is in fact a benefit instead of a negative.